/ / Solar Lunar Get 10% off birthday coupon ! Get additional $2 now ! The purpose of the following Terms and Conditions of Use(‘T&C’) is to establish guidelines on rights, duties and responsibilities of cybermall Users utilizing the internet-related services (hereinafter referred to as the ‘Services’) provided by the 66girls Co., Ltd. cybermall (hereinafter referred to as the ‘Mall’) operated by 66girls Co., Ltd. company (e-commerce company). ①‘Mall’ refers to a virtual business site established by 66girls Co., Ltd. company to trade goods or services (hereinafter referred to as ‘Goods and Services’) using computers and information communication facilities to provide Goods and Services to Users. The term can also be defined as a company operating a cybermall. ① The ‘Mall’ shall, for easy recognition by Users, display the contents of this T&C, name of company and representative, business address(including an address handling customer complaints), phone number, fax number, email address, business license number, e-commerce permit number, and the name of personal information manager on the main page of the 66girls Co., Ltd. ‘Mall’. Only the content of this T&C can be displayed though a link page. ① You may earn Reward Points by purchasing goods, participating in various events on 'Mall'. ② You can use your Reward Points for purchases on 'Mall'. ③ If the order is cancelled, or you fail to order the goods, then no Reward Points will be awarded in respect of order. 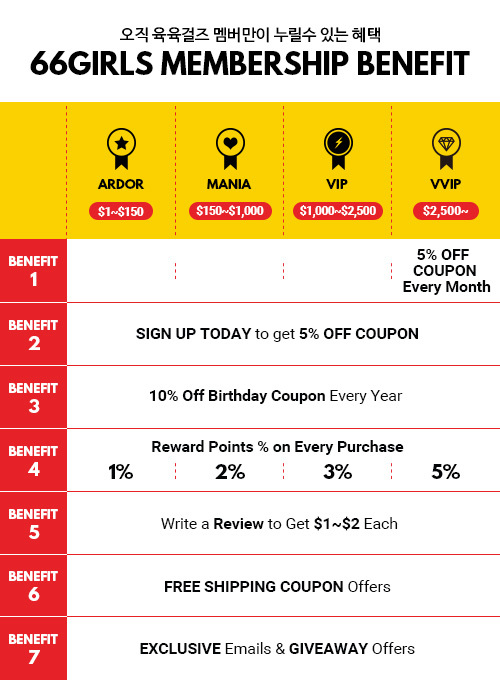 ④ You have the ability to view and manage your Reward Points through your Member Account. ⑤ You can use Reward Points for future purchases. Reward points earned before every 31st of December will expire after Date of Expiration which is every 1st of February (In the following year). Also, Reward points will automatically expire upon cancellation of membership account of the 'Mall'. ⑥ The whole of part of the Reward Points cannot be redeemed for cash nor transferred by the third party. ⑦ The 'Mall' can amend Reward Point Policy at one's option. In reference to amend of Reward Points Policy, the 'Mall' will notify to member prior 30 days. ⑧ For deactivated members who didn't log in their account within 1 year, earned reward points will be expired on the last day of every month.